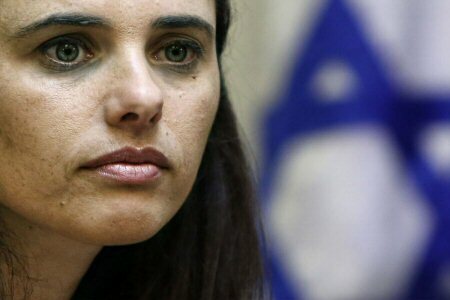 Israeli Minister of Justice, Ayelet Shaked, warned of an “earthquake” that would occur, in the case that the Israeli High Court of Justice decides to overturn the controversial Jewish Nation-State law. Ma’an reported that, according to the Times of Israel, during an interview with the official Israeli Army Radio, Shaked said that the Israeli High Court has no right to strike down the law on constitutional grounds, because it was passed as a Basic Law. The Basic Laws of Israel are the constitutional laws that can only be changed by a super-majority vote in the Israeli Knesset, hence the constitutional underpinning of the Israeli justice system. Shaked added that “the Knesset is the constituent assembly, which defines and determines the Basic Laws. The High Court justices have to interpret the laws in accordance with the Basic Laws,” explaining that she doesn’t believe the majority of the High Court would take such a step. Shaked restated her support for the controversial law, which has been overwhelmingly labeled as a racist policy against non-Jewish minorities. Since the law was passed in July, at least three petitions have been submitted to the Israeli High Court, demanding that the justices overturn the law for its discriminatory nature. One of the petitions was filed by Adalah, the Legal Center for Arab Minority Rights in Israel, demanding the Israeli High Court to overturn it for this reason. The petition was submitted on behalf of all Arab political leadership in Israel, the High Follow-Up Committee for Arab Citizens of Israel, the National Committee of Arab Mayors, the Joint List parliamentary faction and in the name of Adalah, against the Knesset, according to an Adalah press release. The Nationality Law enshrines the status of the State of Israel as the nation state of the Jewish people. The law includes legally preserving Israel’s “democratic” character, its state symbols (national anthem, flag, icon), Jerusalem as the capital of Israel, Hebrew as the official language and the right of return for Diaspora Jewry. Critics of the law raised concerns that the law will deepen a sense of apartheid within the Arab community, which has become a minority over the years.